Brent Purcell is a talented photographer, who was born in Palmerston North and currenlty based in Hamilton, Waikato, New Zealand. Specialising in long exposure landscape photography, Brent’s aim is to capture the beauty of New Zealand and the movement of the sea sky and nature. The Jiuzhaigou Valley, located at the foot of the snow-capped Minshan Mountain, in the north of Sichuan province, China, is a place of exceptional beauty. A nature reserve and a national park, Jiuzhaigou is known for its spectacular jagged alpine mountains, coniferous forests, blue, green and turquoise-colored lakes, waterfalls, limestone terraces, caves and other beautiful features. These bizarre sketches were made by French painter and art theorist Charles Le Brun (1619 – 1690) who was declared by King Louis XIV as “the greatest French artist of all time”. Vertical Forest is a model for a sustainable residential building, a project for metropolitan reforestation that contributes to the regeneration of the environment and urban biodiversity without the implication of expanding the city upon the territory. Amazing 3D art posted on alk3r.wordpress.com. Okay. This is interesting, but with no walls or ceiling, one would need to be pretty certain there was no pending inclement weather, and being in the mountains, they would need to have warm clothing for sleeping. What about taking a shower, brushing teeth? How far to the nearest restaurant? Any danger of wildlife encroaching on the peaceful atmosphere? Hmmm. Think I’ll skip this retreat. 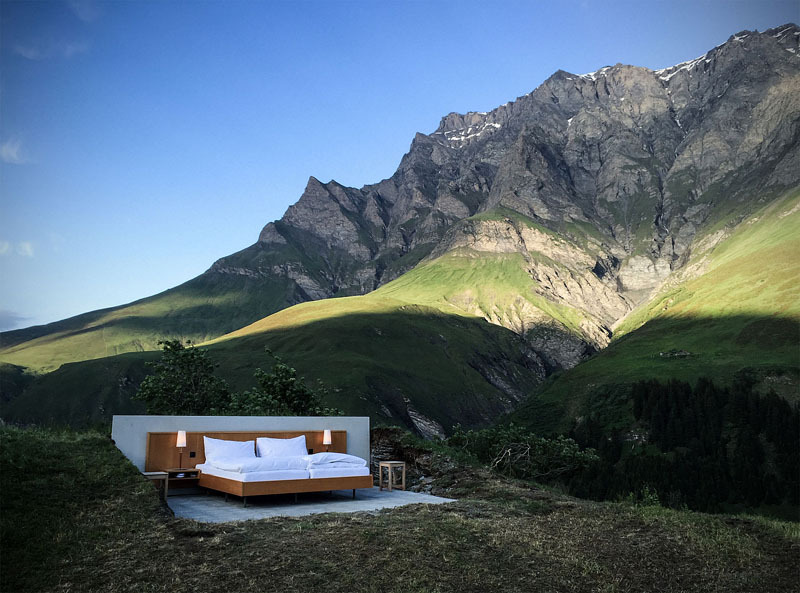 As part of the Null Stern Hotel, designers from Atelier für Sonderaufgaben and hospitality professional Daniel Charbonnier from Minds in Motion SA, have created this unique one-of-a-kind hotel room that has no walls or ceiling. I love travel photography. Wouldn’t mind going along on some of these jaunts. See more at alk3r.wordpress.com. Spud Groshong is a talented photographer and world traveler based in Portland, Oregon. Spud uses Canon 5D Mark II, he shoots a lot of travel, landscape, cityscape and architecture photography.